Edward Hyde, 3rd Earl of Clarendon (28 November 1661 – 31 March 1723), styled Viscount Cornbury between 1674 and 1709, was Governor of New York and New Jersey between 1701 and 1708, and is reputed to have had a predilection for cross-dressing while in Crown office. Viscount Cornbury came to be fabled in historical literature as a moral profligate, sunk in corruption: possibly the worst governor Britain ever appointed to an American colony. The early accounts claim he took bribes and plundered the public treasury. Nineteenth century historian George Bancroft said that Cornbury illustrated the worst form of the English aristocracy's "arrogance, joined to intellectual imbecility". Later historians characterize him as a "degenerate and pervert who is said to have spent half of his time dressed in women's clothes", a "fop and a wastrel". He is said to have delivered a "flowery panegyric on his wife's ears" after which he invited every gentleman present to feel precisely how shell-like they were; to have misappropriated £1,500 meant for the defense of New York Harbor, and, scandalously, to have dressed in women's clothing and lurked "behind trees to pounce, shrieking with laughter, on his victims". Cornbury is reported to have opened the 1702 New York Assembly clad in a hooped gown and an elaborate headdress and carrying a fan, imitative of the style of Queen Anne. When his choice of clothing was questioned, he replied, "You are all very stupid people not to see the propriety of it all. In this place and occasion, I represent a woman (The Queen), and in all respects I ought to represent her as faithfully as I can." It is also said that in August 1707, when his wife Lady Cornbury died, His High Mightiness (as he preferred to be called) attended the funeral dressed as a woman. It was shortly after this that mounting complaints from colonists prompted The Queen to remove Cornbury from office. In 2000 Patricia U. Bonomi re-examined these assertions and found them to be questionable and based on very little evidence. 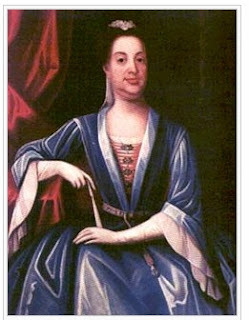 Three colonials, all members of a faction opposed to Cornbury, wrote four letters between 1707 and 1709 discussing a rumor that Lord Cornbury wore women's clothes. There are also some early documents that might be cited to support charges of having taken bribes or misappropriated government funds, but there the contemporary evidence ends. A portrait possibly of Lord Cornbury dressed in women's clothes which hangs at the New York Historical Society. Philip Davenport-Hines, a Fellow of the Royal Historical Society, thinks the portrait accurately depicts Cornbury and pronounced Bonomi's findings inconclusive.